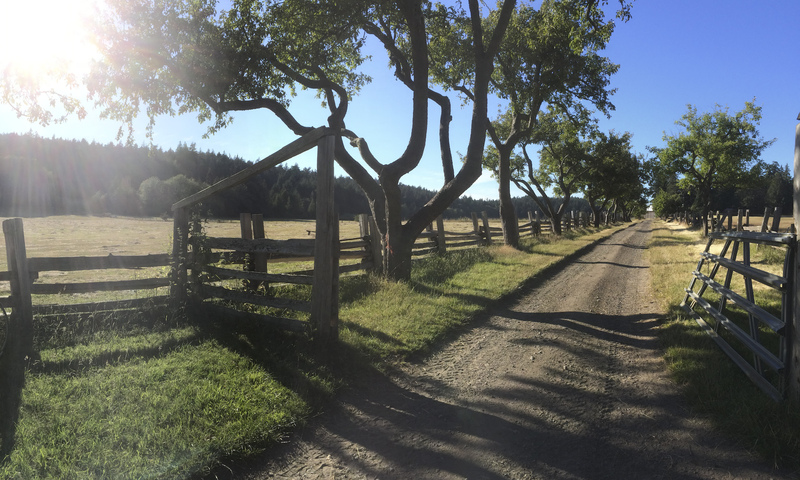 Nestled in the Fulford Valley of Salt Spring Island, Grandview Farm was settled in the 1860’s, and was operated as a dairy farm by one of the original pioneer families for a century. We have been farming this land organically since 2001 and are certified to IOPA and COABC standards. The rich bottomland soil and the clear spring water that flows off the mountainside are what feed our crops and livestock. We offer pork from Berkshire pigs, an old fashioned Heritage breed of pig, known for it’s exceptional table qualities and succulent flavour! It is largely a black breed with a white splash on it’s face. But not all Berkshires are the same…. as it is not just the breed that makes our pork so delicious! Much of pork quality comes from the way in which the pigs are raised. These pigs are raised in open, organic pastures where they are free to run, root and roam. They are rotated frequently so that they have fresh earth to till. By giving them plenty of space to move around and exercise the meat takes on a fine marbling of fat, much like the marbling you see in a good cut of beef. Pigs raised in confinement do not have this marbling, resulting in pork that will be dry when cooked. A pasture raised Berkshire will produce rich, dark meat with a full flavour. The pigs are fed organic vegetable scraps, apples. pears, walnuts and organic, pelleted grain. You can preorder pork by the whole, half or quarter. These orders are ready in late Fall. Pork by the piece is available anytime. We have delicious, gourmet sausages : pork, fig and blue cheese; pork and leek; pork, apple and sage. We raise Mistral Gris heritage chickens from True North Hatchery. These are robust pasture birds that feather early and can go outside to start foraging at a few weeks old . They are fed pelleted organic grain, garden vegetable scraps and all the delights of open pasture grazing – worms, bugs and seeds. The birds are slaughtered at the Salt Spring Abattoir at 12 weeks. Pullets range from 3.5-6 pounds. Cockerels range from 5-8 pounds. Chickens are available seasonally as fresh, whole birds. Frozen, whole birds are available year around. In 2017, fresh birds will be available late June and late September. Chickens are sold for $7/lb – you won’t be disappointed!